To celebrate spring and, with some delay, the completion of my Rockefeller opus, husband Ernest and I decided to visit our past: Israel and Paris, both in their various ways engulfed by conflict. It was an emotion-laden trip for my husband, who grew up in Israel. The fact that it shelters sites of crucial importance to three of the world’s major religions increases the country’s importance and vulnerability. Mythically Christianity, Judaism, and Islam trace their beginnings to the same ancestor–Abraham–who himself migrated to this part of the Near East from Mesopotamia thousands of years ago. Why do religions–which all profess man’s essential goodness–cause, and have always caused, so much strife? I have lived through enough anxious times to know that daily life is amazingly normal even when one’s surrounding are deeply troubled. Our trip to Israel was great. We visited Haifa, Jerusalem, Tel Aviv and the kibbutz Sde Boker in the Negev. Each of the cities had grown tremendously since I last visited some fifteen years ago, and each has its own charm as well as indoor malls and familiar brand-name stores. In Jerusalem we stayed in the Hotel Eldan, within walking distance of the Old City, beautiful as always, with its narrow streets and old buildings hewn out of yellow stone. The ancient synagogues, churches, mosques, Jesus’s Stations of the Cross, and remains of Roman and Byzantine occupations, are concrete reminders of history’s reality. 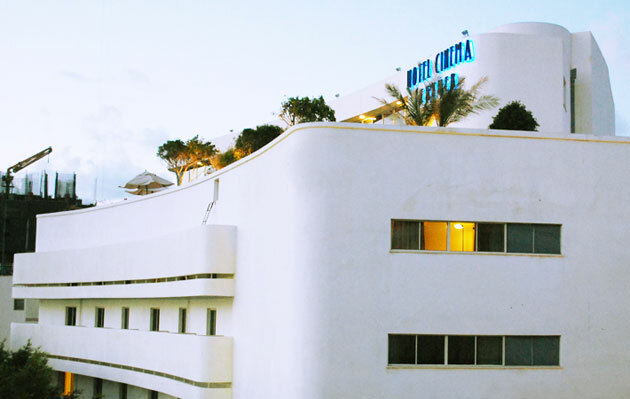 In Tel Aviv, our abode, Hotel Cinema, is part of the unique, now verdant “White City,” consisting of 4,000 Bauhaus-style houses dating from the 1930s-50s. The lobby of the Cinema Hotel, a former movie house, distributes free popcorn to be nibbled while watching a continuous display of old movies. In 2003, the White City became a UNESCO World Heritage site. Haifa, located on the Carmel mountain range adjoining a bay, is strikingly reminiscent of San Francisco. We stayed at the Dan Promenade Hotel, walked along the Louis Promenade, and descended 685 steps in the Bahai Gardens, all along drinking in the view of the shimmering Mediterranean. On our way down to Sde Boker, Israel’s first prime minister David Ben-Gurion’s old kibbutz, we stopped at the Beersheba market, filled with the biggest grapefruit, artichokes and melons I have ever seen. We also encountered camels and Bedouin tents, equipped with TV dishes. The kibbutz is vibrant, though it has abandoned its former rigid communal style. Still, as I was making my way through the alleys that separate small individual habitations, I was enveloped by the general friendliness and goodwill that prevailed here as well as in the rest of the country. What will happen in the Near East? Perhaps those in charge of our fates will come to their senses and let us all of us go on with our little lives. This entry was posted in Uncategorized and tagged bahai gardens, haifa, hotel cinema, israel, jerusalem, judaism, judeo-christian, kibbutz, mount carmel, near east, sde boker, tel aviv, travel, trips, unesco, vacation, white city, world heritage. Bookmark the permalink.